Key aliens and NPCs from the Dawn of Flame Adventure Path come alive on your tabletop with the Dawn of Flame Pawn Collection, featuring more than 100 creature pawns for use with the Starfinder Roleplaying Game or any tabletop science-fantasy RPG! Printed on sturdy cardstock, each pawn presents a beautiful full-color image of an alien, NPC, or starship from the Dawn of Flame campaign, including crafty efreet, rebellious soldiers, scheming gangsters, and dozens of unique creatures. 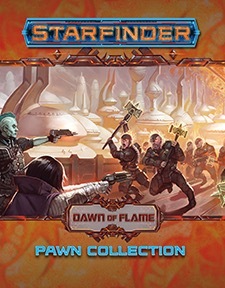 The Dawn of Flame Pawn Collection, together with the creatures and characters from the Starfinder Alien Archive Pawn Box and Starfinder Core Rulebook Pawn Collection, provides pawns for nearly every Dawn of Flame encounter. Each cardstock pawn slots into a size-appropriate plastic base from the Alien Archive Pawn Box, making the pawns easy to mix with traditional metal or plastic miniatures. It looks like after getting no releases in july 2019 (moved to august because of Gen Con), we'll get no products in september 2019 either. This looks to begin shipping on september 30th to subscribers and having a street date of october 16th. I wonder if this will be happening more and more in the future, with the only monthly products being the Pathfinder & Starfinder Adventure Path volumes. It would makes sense financially, but it removes Paizo from the forefront of my mind. I LOVE Dawn of Flames so far!